Ocular Oasis has proudly served the Katy area since November 2005. 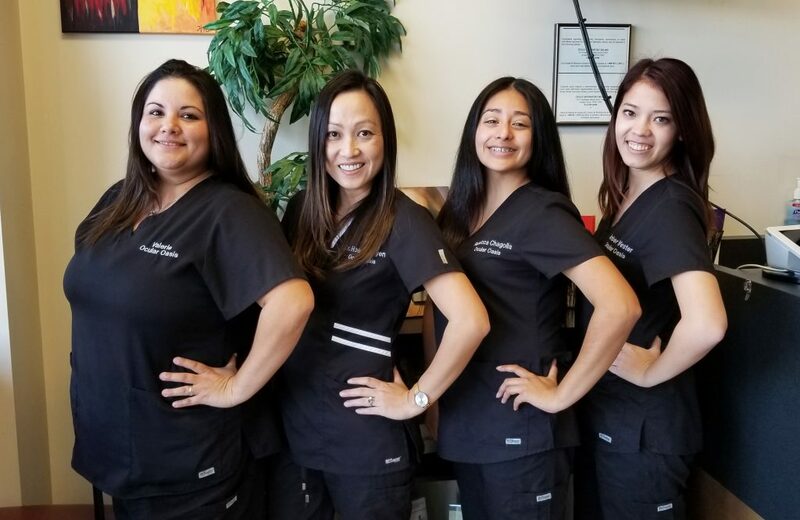 Dr. Hoa T. Nguyen is dedicated to providing the highest quality eye care for the entire family, with a convenient location, extended office hours, friendly staff and the most up to date equipment. We excel in providing our patients with advanced eye care as well as unsurpassed customer service. Refer 2 family members or friends and receive a $20 gift card from Target or Best Buy. You can now have a comprehensive eye exam to detect many eye diseases without the need for having your eyes dilated. 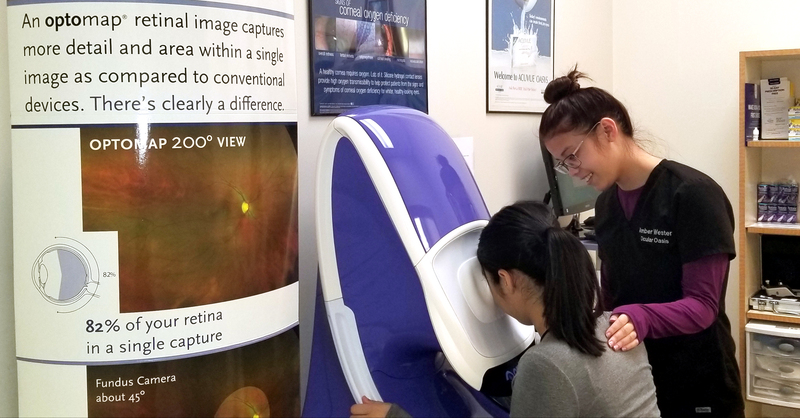 Just like having your picture taken, our Optomap instrument takes a retinal image of the inside of the eye with out any side effects. These retinal images are used to detect diabetes, high blood pressure, holes or tears, macular degeneration, glaucoma, melanomas, floaters and many other retinal disorders. In addition to being convenient and a time saver, the optomap is also a great tool for documentation and future comparison of any abnormality or congenital conditions inside the eye. The optomap is also great for kids who fear the use of eye drops or for those that won’t sit still for a dilated exam. Please call our office to make an appointment to have your retinal images taken. No More Blowing Puffs of Air Into Your Eyes!! Do you hate having the puff of air blown into your eyes? For many, this pressure test can cause great anxiety each year and many tears for the little ones. 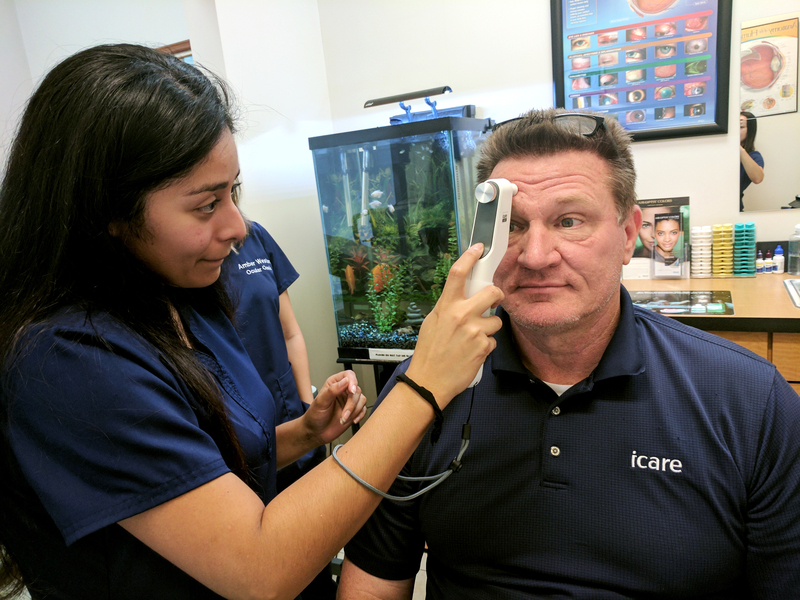 We are now able to more accurately measure eye pressure without the use of any air puff or eye drops. The Icare tonometer is a handheld device that uses a light weight probe to "tickle your lashes". It is much more comfortable for everyone and easily done on kids. Intraocular pressure measurement is important for monitoring glaucoma and many other eye diseases.